Who doesn’t just love a good bit of cheese? Whether we’re enjoying a nice cheese sandwich with a touch of pickle or a bit of cheese on toast with a squeeze of Lea and Perrins, this dairy piece of goodness is a staple in our diets. Did you know that in 2008 Brits were branded Cheddar fanatics? That’s right, according to statistics we all love a bit of cheddar. In fact, we love it so much, we voted it our favorite cheese! Word has it that one in three of us voted Cheddar – Britain’s oldest cheese – as our favorite with around 90% of UK households buying it. Whether it’s mild, medium or mature, we just love the stuff … which is probably why we’re all guilty of buying one too many cheese hampers as well! Despite there being over 700 named cheeses in the UK, we Brits still opt for a traditional plowman’s lunch over the exotic halloumi stuffed peppers. To keep your taste buds churning, here are some quick facts about cheese we bet you didn’t know. Cheese can be made from all sorts of milk – not only cow’s milk but sheep’s milk too! Naturally the number one cheese in the UK, Cheddar is actually the most consumed cheese around the world. Originating in Somerset during the late 12th Century, it took its name from the Gorge of caves down in the town of Cheddar that was used to store the cheese. If you go there today you’ll still see just where this cheese comes from but nowadays Cheddar is made all over the world as well as in Somerset. The Italian favorite, Mozzarella is actually the second most popular cheese in the UK – probably because it’s strewn all over pizza and we Brits just love a good margherita. Traditional Mozzarella cheese is made from the milk of water buffalos herded in the countries of Italy and Bulgaria. However, because it’s so widely popular, most is now made from cow’s milk and manufactured around the globe today. Unlike most other cheeses we eat, Mozzarella isn’t matured either. Instead, it’s eaten fresh, just hours after it has been made. Add a bit of this soft cheese to a few tomatoes and basil and you’ll have the perfect dish! This delicious cheese is probably the most known French cheese in the world and has owned the nickname “The Queen of Cheeses” as a result. Brie is soft cheese, originally named after the French region where it was created several hundred years ago as a tribute to the French kings. Produced from whole or semi-skimmed milk, the rennet is added to the raw milk and heated in order to obtain the curd and give it that extra special flavor. This cheese has become so popular that you can now find it in cheese hampers along with other delicious goodies. At number four is the Swiss favorite, Gruyere cheese. Known for its creamy and semi-soft texture, we love this beautiful choice which originates from a small Swiss village (unsurprisingly named Gruyeres). The texture is dense and compact with a slightly grainy feel giving it a complexity of flavors in the mouth. However, it’s not just the Brits that love this cheese – the Greeks also put it a number of their traditional dishes which explains why this sweet but salty cheese deserves the fourth place. Undoubtedly one of Greece’s most famous cheeses, Feta actually makes up 70% of cheese consumption in its home country. Interestingly, this cheese is now protected by EU regulations, meaning that only those cheeses manufactured in Thrace, Macedonia, Thessaly, and Central Mainland Greece can actually be called “Feta”. Anywhere outside of these locations, it’s simply called “white cheese”. Made from goat’s milk, Feta has earned its popular reputation due to its salty and tangy taste which is enhanced by the brine solution used during manufacturing. Got a hankering for one of these delicious cheeses? 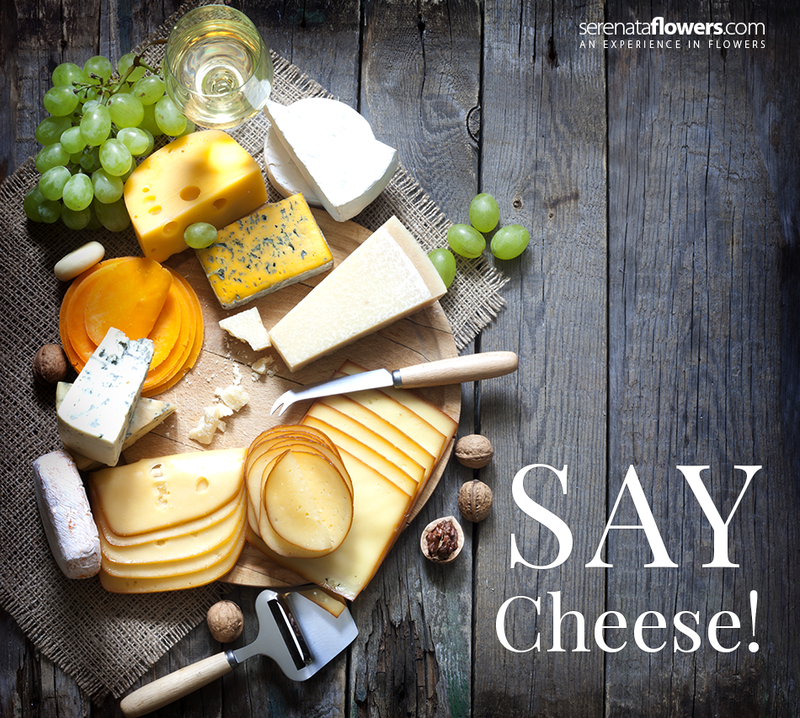 Luckily for you, you can now find the above five kinds of cheese included in our cheese hampers!